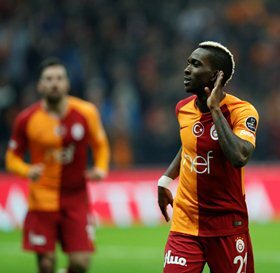 Everton loanee Henry Onyekuru put in his best individual performance since turning professional after scoring three goals as Galatasaray recorded an emphatic 6-0 win against Ankaragucu in the Turkish Super Lig on Saturday evening. The home team got off to a solid start, with Sinan Gumus pouncing on a loose ball to open the scoring in the first minute after a left-footed strike from Onyekuru was blocked. The Nigeria international had the ball in the back of the net in the 21st minute when he received a through ball in the area before beating the goalkeeper. Things got worse for Ankaragucu just before the hour mark as Onyekuru netted his second of the game and Galatasaray's fourth after placing a low shot past the keeper after a fine pass from Fernando. Four minutes later, the Super Eagles star got his hat-trick before Senegal international Badou Ndiaye rounded off the scoring in the 86th minute. Thanks to his treble against Ankaragucu, Onyekuru has now tallied 9 goals from 16 appearances in the Turkish Super Lig.